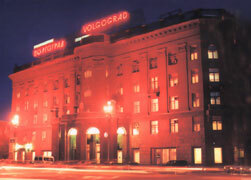 Hotel Volgograd, situated in the downtown Center Square, has itself, become a landmark of this historic city. The majestic center staircase, climbing upward from the lobby, makes one contemplate the famous people who have journeyed up its stairs in years gone by. As a matter of fact, the lobby boasts a "wall of honor", photos of the numerous famous Russians, and others, who have stayed in this hotel over the years. Upon entry to your room, you will find complementary bottled water, tea, coffee, and assorted snacks atop your refrigerator/mini-bar. 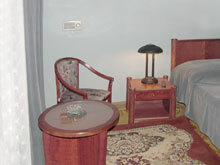 The rooms are nicely furnished, including large comfortable beds, satellite TV, and private baths. The hotel itself offers many amenities including the live piano and violin recitals, performed for two hours each evening at the third floor sitting area. You will also find an exchange office, massage parlor, sauna, small pool, and casino. 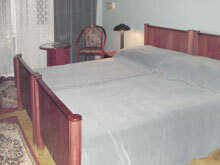 The hotel offers regular and express laundry service. 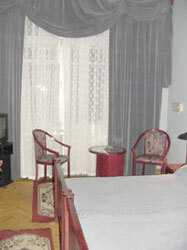 The Volgograd has two bars/cafes, located on the 1st and 3rd floors that are open 24 hours. It also boasts the largest restaurant/ballroom in Volgograd. There is where you will enjoy a very nice breakfast buffet each morning. You will find many other cafes and restaurants within easy walking distance to the hotel, the "embankment' is only a short 5 minute walk. 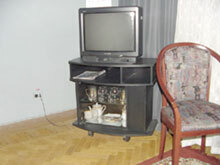 The hotel Volgograd will truly add to you enjoyment of this beautiful and historical city.